We are happy to share that on January 9, 2019 the Lakewood Local Board of Education voted to approve the final resolution to go back on the ballot for a new elementary school in May. Over the last two years Lakewood community members, parents, staff and students have worked together to outline plans for the new elementary school that will house Pre-K through 5th grade. While the plan was voted down in November, we have reached out to understand concerns and will be hosting a series of Q&A sessions this spring on key issues. The issue placed on the May ballot is for $39,800,000 for 28 years and will be collected at an estimated 5.4 mills. The first priority for the bond is the new elementary school. The bond also includes several items for the middle school: a new roof, coping and insulation, air conditioning, sprinkler system, new ceilings and sound control. While the board was saddened by the results of the Bond issue on the ballot in November, they immediately went to work at a Special Board Meeting in December to begin to tackle next steps. 1. Why is a new elementary school needed? Our aging facilities at Hebron and Jackson present many challenges for staff and students. These challenges include: limited educational space, climate control and air conditioning, safety, technology limitations, electrical challenges, lack of air conditioning at Hebron, traveling outdoors between buildings at Jackson, among others. As the buildings continue to get older, maintaining those facilities also becomes more costly. It is for these reasons that we are seeking a new facility for our elementary school students. 2. How did the district decide to build a new school rather than renovate existing buildings? The Elementary Planning Team, led by architects specializing in educational facilities and including community members, staff and students, worked together over several months to explore options to address aging elementary school facilities and educational goals for the future of Lakewood schools. During the study, it was determined that the cost to renovate the school would be more than 80% of the cost to build new. A new building is expected to last for 50 years. The OFCC (Ohio Facilities Construction Commission) recommends building new when the cost to renovate is 66% or greater than the cost to build new. This information led the Elementary Planning Team and the School Board to decide that building new was the best solution. 4. I want to help with the levy. How do I get involved? Thank you for your interest in supporting the levy. Please send an email to the Lancer Pride Levy Committee at lancerprideteam@gmail.com or call the Levy Committee Chair, Jessica Corum at 740-739-3428 and they will be excited to have your help. 5. What are the cost and terms of the levy? The bond issue on the November ballot is for $39,800,000 over 28 years and will be collected at an estimated 5.4 mills. The bond millage is an estimate. Voters are approving the project description, the maximum amount of the bond and the maximum term of the bond. The millage is only an informational item and the tax could change depending on the interest rate at the time the bonds are sold. 6. What is a mill? A mill is 1/10 of one penny. Ex. A mill produces $1.00 in tax income for every $1000 of assessed property value. Example: A $100,000 home times 35% (the assessment rate) equals assessed property value of $35,000 divided by $1,000 equals $35.00 per mill. $35.00 times 5.10 mills equal $178.50 per year. 9. What is the process to design and build the elementary school when the bond is approved? When the bond passes, the district will hire an architect and design firm. The design firm will engage district stakeholders, gather information from previous facilities assessments, and initiate design input meetings. It’s important that our community has input into the features and design of our new elementary school. 10. How will the district choose an architect? Advertising that we are seeking qualified design professionals. Interviewing the firms so they can share their philosophies with respect to project delivery and working with the Board; their practices with respect to quality control measures for the drawings and specifications; and the firm’s approach to construction administration. When an architect is selected, the Board will approve the awarding of the contract to the chosen architect. 11. How does the district choose a builder? Once the final design plans are complete, the project is placed for public bidding. 12. How will the district assure that the project will not be over budget? We are planning conservatively for the construction of the new school by planning at the high end of the estimated cost and planning for contingencies. Additionally, we will use a Construction Manager at Risk (CM-R) program. This allows us to establish a Guaranteed Maximum Price before we begin the construction. That price is the aligned upon cost of the project. At that point, the CM-R would cover any project costs that are driven by errors, corrections or contractor-driven changes. The district would be responsible for any district driven changes or unforeseen conditions of the site. Funds to cover district costs would come from the district’s contingency budget that is planned into the construction cost. 13. What will students do while the new building is being constructed? Students will remain in their current buildings during the construction of the new elementary school. The plan is to complete that project first. Depending on the timeline and scale of the renovations at the middle school, we will reserve Jackson A & B as swing space if needed. The timeline has not yet been formalized because the construction of the new elementary school comes first. 15. How old is the Hebron building? The original building was built in 1914 with a gym addition in 1934 and classroom additions in 1952, 1954 and 1956. 16. When was Jackson Intermediate built? Jackson A was constructed in 1968. Jackson B was constructed in 1972 with additions in 1973, 1974, 1975 and 1976. 17. Why does the district plan to tear down Jackson? When the OFCC estimated renovation and new construction costs at Jackson, their recommendation was to build new. The renovation cost was 83% of the cost to build new. The Jackson facility, while not as old as Hebron, has significant issues including: a leaking roof, leaking foundation, inconsistent heating and cooling, electrical problems, multiple buildings requiring 3rd grade students to travel outside for gym, lunch and specials, as well as significantly smaller classrooms than the state standard. Additionally, having all Pre-K – 5th grade students in one building significantly reduces operating costs (for example, one kitchen instead of two) and reduces student transitions between buildings. 18. What are the district’s plans for the current Hebron Elementary School? We have established a Hebron Yesterday and Today Committee to explore options for the Hebron facility that will be shared with the school board and prospective developers. If you would like to be a part of this work, please send an email to Jamie Roelle who is leading the committee at jamie.roelle@herrealtors.com. 19. Is the central office moving to the “main campus” as well? This plan does not include moving the central office to the “main campus”. The priority of the bond issue is to build a new elementary school and complete major facility upgrades at the high school and the middle school. 20. How is this levy different than the one we passed in November 2017? In November 2017 we passed the renewal of a 5-year emergency operating levy, which supports district operations and did not increase taxes for our community. The levy that is on the ballot for May 2019 is a bond issue for a new elementary school. Passing this levy will allow us to replace aging facilities and create a 21st century learning environment for our elementary school students in grades Pre-K through 5. 21. We’re hearing about multiple levies. What is actually planned? The district has two types of levies. Operating levies which cover the day-to-day expenses like salaries, utilities, maintenance and transportation. And a bond levy that covers large building projects and cannot be used to finance operating expenses. In November 2017, we passed a 5-year Emergency Operating Renewal Levy to support district operations. This allowed the district to move forward with the bond issue to fund the new elementary school and major priority projects at the middle and high schools, which is on the May 2019 ballot. In November 2019 a 10-year Emergency Operating Levy Renewal to support district operations is planned to be on the ballot. 22. What happens if the bond issue fails in May? If the bond issue fails in November, the school board will determine the best time to go back to the community with the bond issue. 23. What happens if the bond issue is passed for a new elementary school but the November 2019 renewal emergency levy fails? The district will go back to the voters in May 2020 for the emergency levy renewal. Because this levy supports district operations, it is vital to maintain it. 24. How do we know that the district spends our money wisely? 25. Why does the district give abatements? Many abatements do not require the approval of the District, however, from time to time the District is asked to approve tax incentives for businesses. In that case, offering the abatements encourages businesses to move into the district. That means more jobs for the people in our community as soon as the business moves in and, while the property tax benefits for our District may be delayed, we will receive taxes from those businesses down the road. 26. What percentage of total property taxes do local businesses in the district pay? Almost a third of the district property taxes collected are paid by businesses located in the community. Therefore, about a third of the taxes needed for the bond issue will come from local businesses as well. As business continues to grow in the community, they could further offset taxes from residents needed to repay the bonds. 27. When will Lakewood High School be paid off? 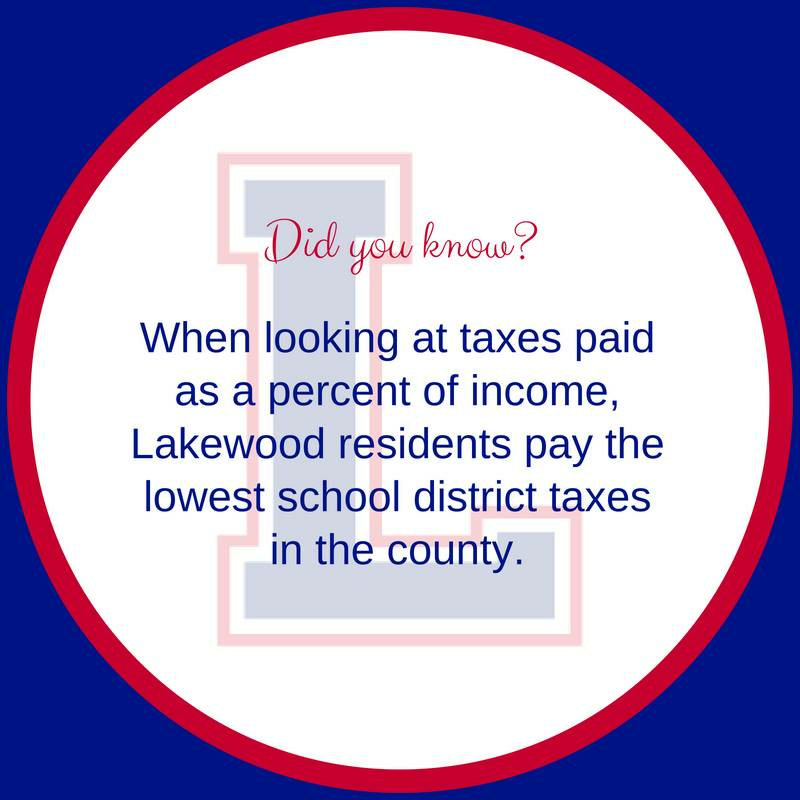 Lakewood High School will be paid off in 2026. This is a separate tax levy assessment that will no longer be paid after that time. Today, residents are paying 1.80 mills for the high school bonds. The average taxpayer with a $150,000 home value will see a reduction in taxes of around $94.50 per year. 28. If the whole district is eventually moved to one campus, and the primary and intermediate schools combined, will fewer administrators be needed? When we combine the primary and intermediate schools, we will review all staffing needs as a result of the new building. Our goal is always to ensure proper supervision and safety of our children and provide a quality education. 29. Why don't you find a different way to pay for the school than raising property taxes again and again, while still renewing emergency levies? We understand that no one likes to see their taxes increase, that’s why we involved a group of community members in helping to determine the best way to fund a new school. The group met for several months with a financial consultant through the Finance Taskforce last year to explore different funding options. After learning about how schools are funded, exploring different funding options and sharing their recommendations with the school board, the school board determined that a property tax was the most affordable and fair way to fund the bond issue. With a property tax, local businesses will pay around 33% of the taxes, bringing down the total cost for our home owners. We also reviewed what we can fund through state monies through the Ohio Facilities Construction Commission to release the burden on our local taxpayers. Our district is ranked 534th out of 610 school districts on the ODE equity rank list (or the 76th "wealthiest" district) with a local share percentage of 88%. A school district’s priority for state assistance from the OFCC is based on the district’s three-year average “adjusted valuation per pupil.” The lower (higher number) we fall on the ranking, the less likely to be eligible for state money. The emergency levies, like the one the community approved last November, fund district operations; things like salaries, utilities, maintenance, etc. and are not allowed to be used for the building of a new building. Those monies are what keep the district running. While we will continue to need to renew the operating levies, those levies have not increased and we do not anticipate needing additional operating funds. In 2026, the levy for the high school will be paid off, reducing the overall tax cost by 1.80 mills to residents in our district. Our average home value is $150,000. For individuals who have a $150,000 home, they will see a reduction of about $94.50 per year at that time. 30. Will this levy only help build a new building or will it also help lower fees and reduce supply needs? This levy will provide a new building for PreK - 5, needed improvements at the middle school and a new roof for the high school. Because it is a bond issue, the monies provided cannot be used to pay for school operations, only for new construction or other permanent improvements. 31. How can I trust the district will use this money like they say they will? The money provided by the bond will be used to build a new PreK- 5 elementary building and several needed improvements for the middle school (HVAC and ducted system, fire suppression system, ceiling and sound control, roofing, coping and insulation). We are sharing this list of priorities to ensure the community is aware of what the bond issue will cover. Community members are also invited to be a part of the design process after the levy passes where we will work with architects and contractors to finalize building design and costs. Decisions regarding architects, contractors, costs, etc. will be made in our public Board of Education meetings which all community members are also welcome to attend. 32. How will this one new building benefit kids across the district? The bond issue will benefit kids across the district by providing a new facility for PreK - 5th grade and taking care of needed improvements at the middle and high schools. Some of the benefits of the bond issue include: fewer transitions between buildings for grades PreK - 5 which has shown to support higher student achievement, more instructional time with fewer bus routes, the latest safety and ADA requirements for our students and better technology infrastructure. We’ve also been able to address some areas at the high school and middle school without additional tax dollars. Those improvements include: safety vestibules at both buildings, renovated science and life skills labs at the middle school, renovated and added bathrooms at the middle school and a student success center at the high school to support career and college readiness. With the work we’ve completed so far and the work we’ll be able to complete when the bond issue passes, all of our buildings will be in good working condition with air conditioning, classroom spaces that support 21st century learning needs, effective technology infrastructure and flexible spaces that will allow for expansion in the future as needed. 33. Why do we have a preschool, how much revenue do we receive and what is the cost? The Lakewood Local School District is required by federal and state law to provide a free and appropriate public education to all preschool children who are eligible for special education services between the ages of three and five. Early intervention for these students enhances their development by laying an educational foundation that leads to greater opportunities in the future and provides assistance and support for their families. We feel very fortunate to offer these services for our community and are proud of the work our preschool staff does to support our students. In recognition of a commitment to quality and an ongoing dedication to the learning and development of children, our preschool has earned the 5 Star Step Up To Quality Award from the state of Ohio, the highest rating possible. Eligibility is determined through a multi-factored evaluation completed by qualified school staff. These services are funded by state and federal preschool monies as well as local dollars. Fifty-percent of the preschoolers in the program are 4-5 year olds without disabilities. These children provide typical role models for our students with disabilities. The cost for these students is partially covered through state early childhood grants, local dollars, and private pay. We have 64 students in our preschool program. The total preschool related revenues received by federal, state and private pay is estimated at $275,000 for this school year. The related expenditures are estimated at $410,000. That leaves $135,000 covered by local dollars. 34. Why did the school board vote to move forward with the stadium when there are higher priority needs that impact teaching and learning, especially Hebron Elementary, on our Facilities Assessment? The Board of Education’s decision to address the stadium was based on several key factors. The first was the pressing need to deal with safety and ADA concerns related to the old bleachers in the stadium. The second was the opportunity to have the booster organization pay for the cost of the new playing turf, at the same time the rest of the stadium was improved. And the third was district’s financial ability to finance the project at a lower cost than might have been the case if the district waited several years to make the improvement. Because of the decision to do the project when we did, the district was able to borrow at 2.87%. As a result, the project is being repaid from the existing revenues of the district, thus not requiring an increase in taxes from our existing taxpayers. The stadium project is one of many projects like the new safety vestibules at the middle and high schools, the student success center at the high school, the renovated science and life skills labs, the restroom renovations and additions and the asbestos abatements at the middle school, that have been carried out by the district in the past few years. All of these projects have been funded without raising taxes, and ultimately have led to reducing the amount of the bond issue that is now on the ballot. Without the financial foresight to address these projects with existing funds, the bond issue would in fact be many million dollars more. 35. What is the total cost of the stadium project and how is it being financed? 36. Does the District receive the monies from sign advertisements at the stadium? The advertising on the scoreboard and press box were created and paid for by the Boosters for all large donors to the stadium turf project. As it relates to the signs that hang on the back of the visitors’ bleachers and on the interior fencing around the stadium, those are fundraisers for football (in the fall) and track (in the spring). Those sign designs and fund collections are applied to the Athletic Boosters for the respective team to use as needed. 37. How many extra classroom spaces are planned for the new elementary school to support growth in enrollment? Based on our enrollment projections, classrooms have been planned to accommodate current classrooms and teachers at Hebron and Jackson, including our two preschool classrooms. The square footage calculations are based on the current OFCC design manual specifications for those spaces, as well as other areas in the school (offices, gymnasium, cafeteria, kitchen, etc.). We have planned additional square footage comparable to 2 classrooms that could accommodate additional enrollment. The new building would also be designed in such a way to accommodate adding on to support future needs. 38. How much would the stadium repairs have cost vs. building a new one? Because we decided to do a complete project at the stadium, we worked to determine the best ways to renovate the existing facilities and what to build new based on how the stadium would supports students, staff and the community. Given the state of disrepair of both the bleachers and and track indicating replacement was truly needed, repairing them was not considered. The bleachers and track (including curbing, drainage and inside fence) were bid out separately and were awarded accordingly: Bleachers to Dant Clayton at $692,122 and Tract to The Motz Group, Inc. at $677,150. The old concession stand was renovated to continue to operate as a restroom facility and a trainer room was created. We chose to build a new building that includes the concession stand, restrooms, ticket booths and storage to make the best use of the stadium, as those needs could not be fully supported using the old concession stand building. As part of the Elementary School Planning process, community members and staff learned about school finance and worked together to propose a financing recommendation to the Lakewood Board of Education. Notes and articles from their meetings can be found at this link. Get a quick overview of the bond issue in a printable document. Use this tool to see your estimated tax cost for the bond issue. See our taxes as a percent of income compared to other districts in Licking County before and after the bond issue. Make sure you're ready to vote on May 7th!